Apologies if this is not a new topic. Exit doors positioned to allow quick evacuation in an emergency. Wing root chord limited by need to evacuate. Wing span limited by airport handling facilities. Seat positions close enough to the aisles to allow quick evacuation. Engines and fuel positioned away from the passengers, for survivability. Huge inertia and scale require extra-powerful controls to respond quickly enough. Emergency exits are a problem. They cannot be directly downwards as the u/c might have collapsed on landing, if it was ever lowered. They cannot be directly upwards due to the need for injured passengers to climb up and also the time for that and to slide off the wing. In the leading edge they would need to be exceptionally precisely engineered, making them expensive, heavy and easily damaged. In the trailing edge they would need hugely lengthened doors that nevertheless could be easily opened by hand. Engines above and behind would crash down on the passengers if they broke free. Fuel safely stored in the outer wings would be a long way from the engines. Some improvements could be made by moving the engines back to the traditional hanging leading-edge pods. This would allow upper trailing-edge exit doors to operate by dropping down onto the floor to open. But passengers at the front of the delta would still be too far away, so that has to be abandoned and a more traditional swept wing of greater span used. A smooth cranking of the wing to give outboard dihedral would shorten the otherwise extra-long undercarriage while raising the tips clear of the ground at takeoff. This is opposite of the A380's gulled wing - one might even have an S-dihedral, with the intermediate section of each wing having reduced dihedral. But the big problem remains, how to accommodate such a huge wing span? Another approach would be to take the A380 a few steps further. It is designed for a stretched fuselage length, that's easy. But the fuselage width is limited b the need to avoid a deep auditorium-style room space, it is already taller than it can be made wide. A third deck would be a heavy, inefficient answer on such a fixed width. Better to add another fuselage or two. With the wing root chord and span already at the limits, some increase in the mid-section chord would help, also a lifting tail using relaxed static stability, a new foreplane so that the wing can be used more efficiently and possibly even a second wing in tandem, all beginning to look very like a Burt Rutan design on steroids. Permanent soaring city A giant flying wing, this craft has no engines, but soars in the updraft found along Southern mountain ranges such as found in South America and New Zealand. It has an almost indefinite span, being on this scale flexible rather like some of the experimental ultra-lightweight solar aircraft. One can fly a new wing section up to it, bolt it on and then remove the ferry power unit. Mega-liner Triple-hulled, tandem-winged four-surface airliner. 3,000 passengers, Six engines of near-double-Trent class. Fits within the 80m x 80m handling box of current major airports. Getting there. Note enough wings, not enough engines, not enough bigness yet. Oh, but it did, albeit not by much. I added some stainless steel -300 tips I found on ebay. That's AFTER I'd tested about 5-6 glues to see what would stick them to the styrene! 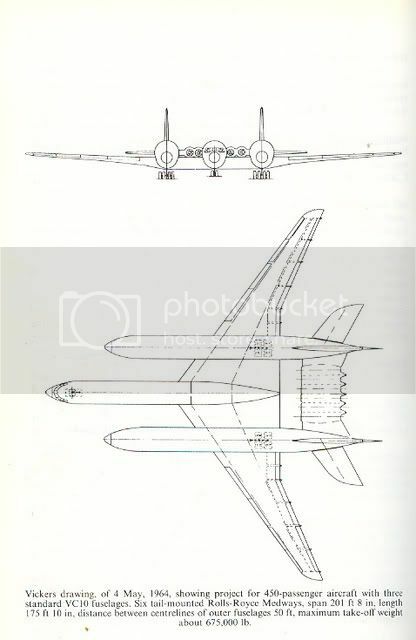 How about a passenger carrying variant of the Stratolaunch/Rutan Roc? Passenger pod instead of the rocket, and cabins in the fuselages as well. Not at all practical, but would be impressive. Personally, I believe that giant, steam-powered airships offer the best solution to all your problems! Well obviously, but the thread is "Giant Aeroplanes". Lockheed did investigate this set-up, the model was displayed in their front foyer for a long time. Love the triple....imagine seeing ( and hearing ! ) that take off ? Ahh! The deck of a model warship grafted on top of a model Zeppelin, now that would be a whiff worth posting! Mind you, one element missing from the designs I have seen is that all the deck fittings make the beast top-heavy. Essential to its flight stability are a couple of stub wings with powerful ailerons (or all-moving), linked to a Babbage engine to provide artificial stability. Naturally, the code for the engine was written by Ada, Countess Lovelace.